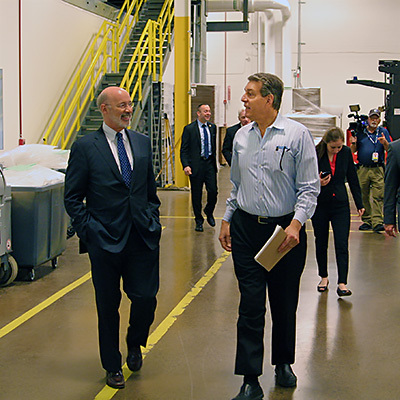 Southampton, PA — On Monday, May 14, Pennsylvania Governor Tom Wolf visited plastic tubing manufacturer NewAge Industries located in Southampton, Bucks County, Pa. Governor Wolf was invited by Ken Baker, NewAge’s CEO, for discussions on the company’s employee ownership program and a tour of the newly-expanded facility. NewAge’s ESOP – Employee Stock Ownership Plan – has seen tremendous growth since it was established in 2006. In fact, the company’s stock price has risen over 850% since the plan’s inception. The ESOP owns 49% of NewAge, via shares of stock, and was established to motivate and reward employees. It is a benefit that addresses income inequality by building wealth for employee-owners’ retirement years, even when wages may not be growing significantly. NewAge offers a 401(k) retirement savings program, but many of the company’s employee-owners will tell you that their ESOP account growth has far surpassed their 401(k) performance. An ESOP also offers an option for business owners who wish to avoid selling to competitors or private equity or liquidating when they choose to no longer operate the company. 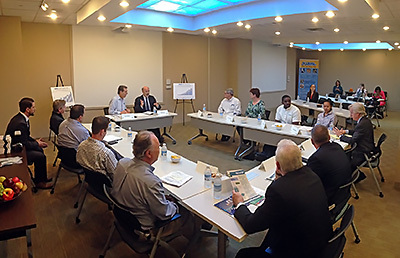 The Governor’s visit included two roundtable discussions, the first with current and retired NewAge employee-owners and a second with CEOs of other area ESOP companies. Pennsylvania State Representatives Bernie O’Neill and Frank Farry, Philadelphia City Councilman at-Large Derek Green, and representatives from PaCEO, the Pennsylvania Center for Employee Ownership, also participated in the discussions. A tour of NewAge Industries’ recently renovated warehouse space was led by Baker and NewAge’s Jeff Johnson, chairman of the company’s ESOP committee and director of its Verigenics® RFID division. The renovations converted over 40,000 square feet of vacant space into production clean rooms, inspection rooms and storage areas for the company’s AdvantaPure® division, which manufactures high purity tubing, Single-Use components and molded assemblies for the biopharmaceutical processing industry. The expansion was fully funded by the company and has helped create new jobs. NewAge employs 160 people and has hired 28 new employee-owners over the past year. During the tour, Governor Wolf saw many of NewAge’s sustainability initiatives. The building is solar powered – over 4,000 solar panels on the facility’s rooftop absorb the sun’s energy – and the company is pro-recycling and landfill free. Lighting, HVAC and electric motor upgrades make efficient use of power, and the grounds house a Level 2 electric vehicle charging station, capable of charging two cars simultaneously. Learn more about NewAge Industries’ ESOP at http://www.advantapure.com/esop.htm, or contact the AdvantaPure team at 145 James Way, Southampton, PA 18966; phone 888-755-4370 or 215-526-2151; fax 888-258-4293 or 215-526-2167; e-mail: sales@advantapure.com.